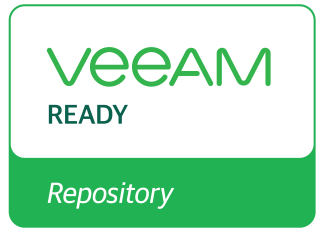 *This Veeam Ready test was performed with storage having a configuration that includes SSD/Flash. As such, this classification only applies to similar configurations in which the same amount or more SSD drives are used. The use of non-SSD drives may negatively impact performance. Drive quantity, size, type: 2 – 1.2TB, SAS 10K RPM 2.5" | 6 – 960GB, SSD SATA 6Gb/s 2.5" | 36 – 10TB, SAS 7200 RPM 3.5"
FUJITSU Storage ETERNUS CS800 is a turnkey data protection appliance and provides a simple and affordable solution for customers which follow a disk backup strategy with deduplication. The advanced deduplication technology reduces typical disk capacity requirements for disk to disk backup by up to 95%.